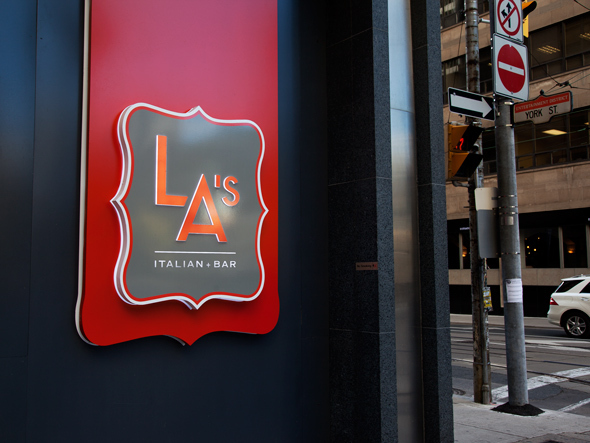 LA's Italian Bar is an updated version of Little Anthony's, which has occupied the corner of Richmond and York streets for 17 years. Recently taken over by the next-gen restaurateur Andreas Antoniou, the restaurant relaunched in April after a complete and much-needed renovation. With the kitchen helmed by an experienced chef in Aaron Foster (previously at DEQ at the Ritz-Carlton), diners looking to duck in and chow down pre-theatre in a fresh and inviting atmosphere will not be disappointed. With a large bar flanked by plush banquettes, there's a comfortable vibe going on here. We managed to snag a sumptuous banquette that is surrounded by large panoramic windows affording excellent people watching opportunities. Service is swift and concise, and we appreciated their fluffy focaccia bread basket (with addictive earthy olive oil accompaniment) being replenished without a judging eye. Winos should rejoice, too. 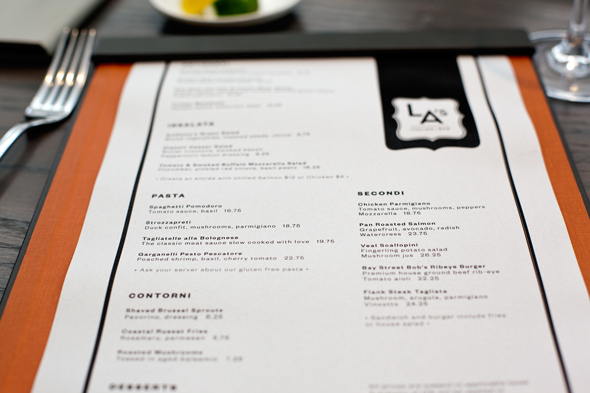 The list here is extensive and their prices are thoughtfully not gouging. 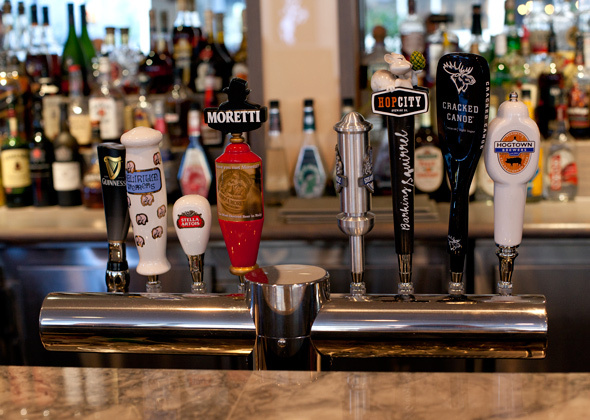 Beer drinkers will be mostly sated by their top notch mash up of imports and premium domestics (Guiness, Moretti, Stella, Delerium, Hop City, Steamwhistle, Cracked Canoe and Hogtown). We were immediately lured to the Smoked Buffalo mozzarella salad with skinned yellow tomatoes, cucumber bricks, pickled red onions and a smattering of basil pesto ($16.25). While the price is a tad steep, the components are fresh, carefully compiled and utterly delicious. 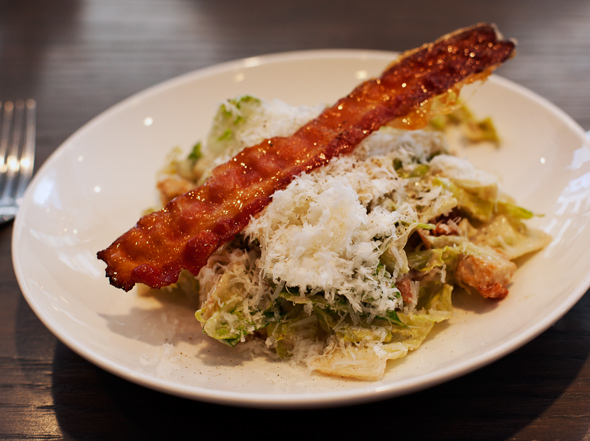 The Classic Caesar Salad ($9.25) with butter croutons featured a heavy hand of parmesan cheese and rich creamy dressing was decent, but greatly enhanced by the honey caramelized bacon rasher. But perhaps this one could be plated a little less, um, phallically? 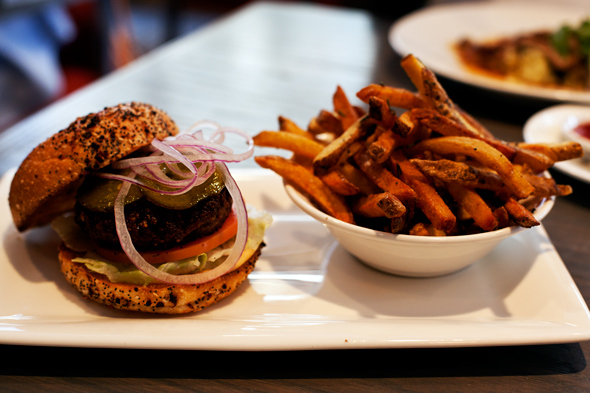 Jumping on the burger bandwagon, LA's burger ($22.25) is house made from rib-eye on a grilled 'everything' bun with your usual tomato/pickle/onion toppings. I know according to health and safety folks you should cook your burger to almost well, but I prefer mine slightly under that. The tomato aioli came to the rescue and provided a much needed dose of saucy goodness. Accompanying rosemary inflected fries were savoury and tasty, if you like rosemary. That's an expensive bit of ground beef, but the choice cut pays off with a particularly juicy patty. 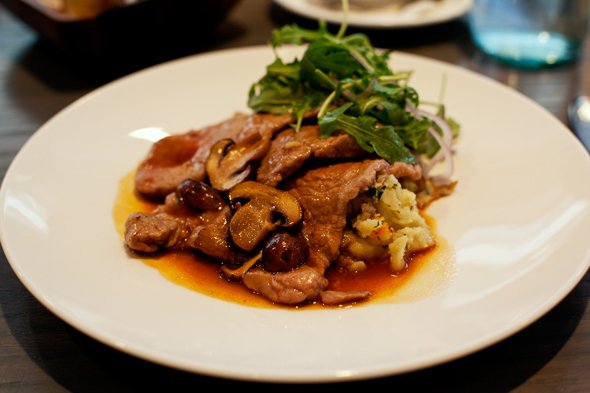 Veal scallopini ($26.25) with smashed fingerling potato salad featured three delicate portions of tender veal blanketed in a mushroom broth. Satisfying indeed, the veal was cooked perfectly, and I loved the casual arrangement of the potato salad, tucked in under the meat so that it absorbed all the flavours. These were some of the best potatoes I've ever inhaled. With Andreas' other sister restaurant ( Estiatorio VOLOS ) kitty corner to LA's he can keep a watchful eye on this new venture. It's already off to a solid start. With seasonal changes to the menu on the way, I'll likely be back for a return visit. 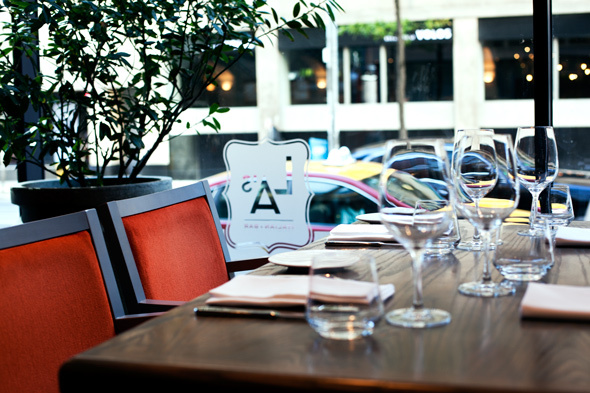 Little Anthony's welcomes reservations and can accommodate groups for private dining.